Adrian Grenier (born July 10, 1976) is an American actor, producer, director, musician and environmentalist. He is best known for playing Vincent Chase in the TV series Entourage (2004–2011). He starred in the films Drive Me Crazy, The Devil Wears Prada, and Entourage. He lives in Clinton Hill, Brooklyn. Grenier was born in Santa Fe, New Mexico, the son of Karesse Grenier and John Dunbar. His parents were never married. He was raised by his mother in New York City. His father was from Ohio, and has English, German, Scottish and Irish ancestry. His mother was born in New Mexico, to a family of mostly Mexican (Indigenous, Spanish) and some French descent. A DNA test on the series Finding Your Roots showed Grenier to have approximately 8 percent Native American ancestry and that his direct matrilineal line is Native American. The program determined that his ancestor Diego de Montoya (born in Texcoco, New Spain, in 1596) was the leader of an encomienda, a protectorate of Puebloan peoples in Pueblo San Pedro in New Mexico. He shares this ancestor with author and commentator Linda Chavez, making them ninth cousins. Grenier graduated from Fiorello H. LaGuardia High School of Music & Art and Performing Arts and attended Bard College in New York. In 1997, Grenier left Bard to embark on a film career. He made his film debut in the independent drama, Arresting Gena, then in 1999 played opposite Melissa Joan Hart in Drive Me Crazy and in 2001 starred in James Toback's Harvard Man. In 2004, Grenier played Vincent Chase in the HBO series Entourage, gaining his most substantial notability and success. The series followed the triumphs and trials in the life of Chase, as the movie star character and his friends lived the good life in Los Angeles. It ran for eight seasons, from 2004–2011, and was nominated for numerous Emmy Awards, including Outstanding Comedy Series. In 2006, he played Nate Cooper, the boyfriend of Andrea Sachs (Anne Hathaway) in The Devil Wears Prada. In 2013, he starred in the post-apocalyptic film Goodbye World alongside Gaby Hoffmann. It premiered at the 2013 Los Angeles Film Festival where it received good reviews. The film made its cinematic release in the United States on April 4, 2014. Grenier stepped back in front of the camera in 2015 to reprise his role of Vincent Chase in the Entourage film adaptation. Filming began in January 2014 and the film was released in June 2015. He is a campus advisor for Academy for Global Citizenship in Chicago, Illinois. As a vehicle for Grenier to transition between acting, directing and producing, with some partners, he started Reckless Productions in 2001. The company focused on producing socially minded films. One of its first, Shot in the Dark, chronicled Grenier's journey to reconnect with his estranged father, Dunbar, with whom his mother broke up when he was still a baby. Grenier and Dunbar remained estranged for 18 years until he began work on the documentary in an attempt to forge a relationship with him. The two eventually reunited and continue to remain in contact. This was Grenier's directorial debut and the film premiered at the 2002 Tribeca Film Festival. HBO distributed the documentary and it premiered on the channel on June 3, 2007. On June 2, 2008, Grenier premiered a new television series, Alter Eco (not to be confused with Fair Trade importers Alter Eco), for which he was the producer. The show aired on the Discovery communications channel, Planet Green, and featured Grenier and a team of green experts showing changes that can be made to live a more eco-friendly and sustainable lifestyle. On September 27, 2010, HBO premiered Teenage Paparazzo, another documentary directed by Grenier and produced by Bert Marcus. It premiered at the Sundance Film Festival. The film focused on 13-year-old paparazzo, Austin Visschedyk, and the celebrity obsessed world in which he operates. It also featured interviews with celebrities such as Lindsay Lohan, Alec Baldwin, and Whoopi Goldberg. Grenier worked on the documentary for three years as a producer as well. Aside from HBO, Teenage Paparazzo premiered on 40 other outlets around the globe. In addition to its theatrical release, Grenier took the documentary to College campuses nationwide in the Teenage Paparazzo "Experience Tour." The tour included a call for art to be included in a traveling gallery that challenged the traditional understanding of celebrity and modern media. In 2010, Grenier began working as a producer alongside producer Bert Marcus and director Matthew Cooke on the full-length feature documentary, How to Make Money Selling Drugs. The film was a tongue-in-cheek look at what is considered to be one of the worst domestic policy failures in recent American history. It featured actual dealers and even celebrities commenting on the subject including; 50 Cent, Eminem, Susan Sarandon and David Simon, head writer of acclaimed HBO series The Wire. It was released in the summer of 2013 on Amazon.com in addition to iTunes and received positive reviews. An advocate of sustainable living, Grenier and his business partner, film producer Peter Glatzer founded the lifestyle brand SHFT.com in 2010. SHFT is a brand which promotes sustainability through film, design, art and culture and lives both online and offline. Its mission is to nudge sustainable ideas and products into pop culture, and to provide context for an inspiring, modern, sustainable way of life. By using creative content it engages its audience who shop, watch content, and get their news online. SHFT has partnered with prominent brands such as; Ford Motor Company, AOL/Huffington Post, Virgin America, Stonyfield Farm, The W Hollywood, The Weather Channel, and Estée Lauder. In its second year, SHFT won two Webby Awards for best website in its category. In 2014, Grenier and Glatzer partnered with Stone Barns Center for Food and Agriculture to create SHFT Mobile Kitchen Classroom – a teaching kitchen on wheels for high-school students in New York City. Through lessons on cooking, science, technology, and sustainability, it is designed to help teenagers understand how the food choices they make relate to broader issues of personal and environmental health. Grenier plays guitar, bass, drums and harmonica. He was a member of two New York bands: the lead singer in Kid Friendly and the drummer in The Honey Brothers before moving on to build Wreckroom, a music incubator and recording studio in May 2012. His intentions were to create a space for friends to write, perform and record music. However, the equipped studio eventually evolved, becoming a breeding ground for fresh talent. Over fifty artists made use for twenty spaces from the basement in Brooklyn. The next year, Grenier started Wreckroom Records and described as "the manifestation of a boyhood dream." Importantly to Grenier, Wreckroom requires that artists participate in the community. As he told Billboard in 2015, "You don't just come in, take your record and go and promote yourself. You become part of the family." Artists are vetted by Grenier and his team: Damien Paris, Mike Frankel and Brian Koerber. Selected musicians join the team for a full day session, in which they professionally record an original song and film a live-style music video. Wreckroom releases EPs in addition to a video series of cover songs, titled "Under the Covers" and two bands, Missouri "punk 'n' roll" trio Radkey and metal-spined Brooklyn five-piece The Skins, released EPs on the label in 2013. Wreckroom also hosts curated music showcases in both Brooklyn and Austin, the latest a 3-day takeover of legendary Arlyn Studios in 2016. The Skins were one of the first bands to record in the Wreckroom and their talent led Grenier to not only sign the group to Wreckroom but also to agree to manage the band. The group is based in Brooklyn and consists of siblings Bayli, Reef, and Kaya Mckeithan, along with friends and dueling guitarists Daisy Spencer and Russell Chell. In 2015, Adrian took on a role as Dell’s first Social Good Advocate, championing healthier, more sustainable choices and actions through digital storytelling and advocacy. Adrian partners with Dell to advance the company's 2020 Legacy of Good goals including advocating for adoption of the circular economy. Together, Dell and Adrian launched the NYC Tech Takeback program to make it easier for New Yorkers to responsibly recycled their used technology through the Dell Reconnect program. In 2016, they launched the Legacy of Good Short Documentary Film Contest to further explore the challenges and benefits of a circular economic model. Dell also supports Adrian's own social good efforts including powering his Lonely Whale expedition and a virtual reality experience, “Cry Out: The Lonely Whale Experience." Together they've kicked off a feasibility study to explore the use of ocean plastics in Dell packaging. Adrian Grenier has long been active on behalf of environmental and social causes – from his role as the first Social Good Advocate for Dell computers, to creating the Lonely Whale in 2015 as a vehicle to inspire empathy and action for protecting the ocean environment and marine life. In December, Grenier attended the COP 21 climate talks in Paris and advocated alongside ocean explorer Sylvia Earle and wildlife conservation leader Dr. Jane Goodall for swift action to reduce global carbon pollution. Recently, he announced with Dell the launch of a market based plastics packaging feasibility study designed to reduce plastic waste from entering the ocean. "I decided to co-found the Lonely Whale Foundation after seeing the power the Lonely Whale's story had to connect all of us to our oceans. Sometimes climate change can seem overwhelming but I think that 52 has helped us recognize that and connect with one another, and ourselves, to make changes. We realized that filming the documentary alone wasn't enough. It's my hope that connecting our children, and also our global community, with the Lonely Whale story through education and awareness programs we will inspire change. As we grow our community we will inspire both individuals and organizations towards making significant changes to support ocean health. Today's children are tomorrow's environmental leaders. The more we can educate the next generation about the state of the ocean and what they can do everyday to make a difference, the better prepared they'll be to ensure ocean health improves and stays healthy for multiple generations." On World Environment Day 2017, Grenier was appointed as a goodwill ambassador for the United Nations Environment Programme. Grenier was chosen for his dedication and support of organizations focused on habit-changing education, most notably through his work with the Lonely Whale Foundation. In his new role, Grenier will advocate for reducing single-use plastic and for the protection of marine species, as well as encourage his followers to make conscious consumer choices to reduce their environmental footprint. Grenier has shown his support for Little Kids Rock, a national nonprofit that works to restore and revitalize music education in disadvantaged public schools, by filming a PSA for the organization. Grenier is a Board Member at React to Film, a non-profit that leverages the best documentary filmmaking to promote social responsibility and spark civic engagement. Grenier is also a supporter of Charity Water and co-hosted the first annual Charity Water Ball in 2006 with Jessica Stam. In 2009, Grenier launched an eco-themed app for the iPhone and Android mobile platforms. The app, called Ecohero, incorporated a barcode-scanning technology to help consumers weigh products' environmental and health impact. Ecohero also contained other functions, such as a carbon calculator and eco-encyclopedia. In 2012, Grenier partnered with former Nike designer Justin Hawkins to found Churchkey Can Company, a Seattle-based microbrewery. The brewery's name refers to its flagship beer, which must be opened using a can piercer, or "church key". Grenier is an investor and advisor to the mobile video app MONTAJ. Released in January 2013, MONTAJ allows anyone to create videos, joining small (5 seconds or less) video clips using a smartphone camera. ^ Schuster, Dana. "Wanna be in my gang? ", New York Post, January 27, 2013. Accessed February 8, 2019. "Before you enter Entourage star Adrian Grenier’s Clinton Hill Victorian townhouse, toss your junk food to the curb." ^ a b c Gates, Henry Louis, Jr. (2014). Finding Your Roots: The Official Companion to the PBS Series. UNC Press Books. p. 382. ISBN 9781469618012. ^ Jurgensen, John (March 22, 2012). "Doubling Down on DNA". The Wall Street Journal. ^ "Q&A with Adrian Grenier". HBO Connect. 2013. Archived from the original on 2015-02-05. Retrieved 2015-02-05. ^ Esquibel, Jose Antonio. "Mestizaje: Indian Roots In 17th-Century New Mexico Family Genealogy". goodreads.com. Retrieved February 15, 2016. ^ Keck, William (August 12, 2004). "No need for his own 'Entourage'". USAToday.com. ^ Kapes, Serena (August 18, 2004). "Breakout Star: Adrian Grenier". People.com. Retrieved February 15, 2016. ^ Entourage Season 8 Preview, People, July 2012. Retrieved March 2014. ^ Goodbye World Trailer Starring Adrian Grenier, Gaby Hoffman, Ben Mckenzie and Mark Webber arrives April 4, 2014, RamaScreen.com, March 2014. Retrieved March 2014. ^ Kit, Borys. 'Entourage' Movie Starts Shooting, Variety.com. Retrieved March 2014. ^ Entourage Movie Gets A Release Date, Hollywood Reporter, 25 February 2014. Retrieved March 2014. ^ Harrington, Maureen. Adrian Grenier Talks About Finding His Father, People.com, 6 May 2007. Retrieved March 2014. ^ Interview with Adrian Grenier About His New Drug Documentary, Vice.com. Retrieved April 2014. ^ a b "Adrian Founds Shft.com". Adrian Founds Shft.com. Retrieved February 14, 2012. ^ Dean, Sam. Adrian Grenier's SHFT Mobile Kitchen Classroom Is a Food Innovator Awards Finalist, Bon Appetit, 4 February 2014. Retrieved March 2014. ^ Novak, Sara. Adrian Grenier and the Honey Brothers Talk Green Living at the Wanderlust Festival, TreeHugger.com, 27 July 2009. ^ a b "Adrian Grenier on 'Entourage,' His Wreckroom Label and Studio and 'Rejecting the Fame Promise'". Billboard. Retrieved 2016-05-08. ^ Hogan, Marc. 'Entourage' Guy Starts His Own Music Label, Spin, 31 May 2013. Retrieved March 2014. ^ "SXSW 2016: 7 Bands You Need to Know Now". Music Times. 2016-03-22. Retrieved 2016-05-08. ^ "Meet The Skins: A Teenage Band with Entourage Support". Fuse. Retrieved 2016-05-08. ^ Heing, Bridey (2015-06-30). "This Isn't Your Average Home Ec Class: Students in Mobile Kitchen Classroom learn more than how to separate an egg. They leave knowing what it means to be a "food citizen."". Medium. Retrieved 2016-05-08. ^ "Hollywood Atar and Environmentalist Adrian Grenier Appointed UN Environment Goodwill Ambassador". 2017-06-05. Retrieved 2018-04-18. ^ "Adrian Grenier Designated as UN Environment Programme Goodwill Ambassador". 2017-06-06. Retrieved 2018-04-18. ^ Little Kids Rock PSA Featuring Adrian Grenier, YouTube. Retrieved January 15, 2014. ^ Adrian Grenier: Charity Work, Events and Causes, looktothestars.org. Retrieved March 2014. ^ 'Entourage' Star's iPhone App, Forbes.com, May 2009. Retrieved March 2014. ^ Actor Adrian Grenier Teams Up With Portlanders To bring back Beer In Flat-Top Cans, oregonlive.com, March 2012. Retrieved March 2014. ^ a b Adrian Grenier-backed MONTAJ aims to let iPhone users create videos simply by shaking their wrist, TheNextWeb.com, January 2013. Retrieved March 2014. 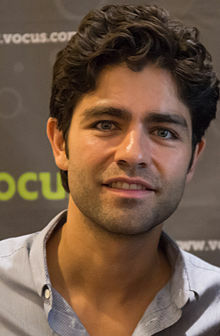 Wikimedia Commons has media related to Adrian Grenier.